4-8 cell stage mouse embryos. Our Abpromise guarantee covers the use of ab16286 in the following tested applications. ab35768 - Rat monoclonal IgM, is suitable for use as an isotype control with this antibody. SSEA3 is a globoseries carbohydrate antigen present on both cell surface glycolipids and glycopeptides. It was described and named as part of a series of embryonic antigens, defined by monoclonal antibodies isolated in the lab of Prof. Davor Solter (Shevinsky L. H. et al., 1982, Cell 30:697 and Kannagi R. et al., 1983, J. Biol. Chem. 258:8934). SSEA3 is found on the surface of mouse oocytes, becoming restricted to the intracellular mass of the early blastocyst and then to the primitive endoderm. It is present on the surface of human teratocarcinoma cells (EC), embryonic germ cells (EG) and embryonic stem cells (ES) but not mouse undifferentiated mouse cells of these types. SSEA3 expression decreases as human EC, ES and EG cells differentiate but increases on differentiation of mouse EC, ES and EG cells. It is also found on the surface of mouse erythrocytes. Human induced pluripotent stem cells (iPSCs) stained with ab16286 (red fill). In brief, iPSCs were fixed in 4% formaldehyde (methanol-free) for 15 min at 25°C. Cells were then incubated with the antibody (ab16286, 1/50 dilution) for 30 min at 4°C. The secondary antibody used was Alexa Fluor® 647 goat anti-rat IgG at 1/2000 dilution for 30 min at 4°C. iPSCs differentiated for 28 days toward a cardiomyocyte lineage (blue fill) were used as a negative control. Acquisition of >30,000 total events were collected using a 100mW solid state diode laser (640nm) and 670/30 bandpass filter. Immunocytochemistry/ Immunofluorescence - Anti-SSEA3 antibody [MC631] (ab16286)This image is courtesy of the laboratory of Peter Andrews. 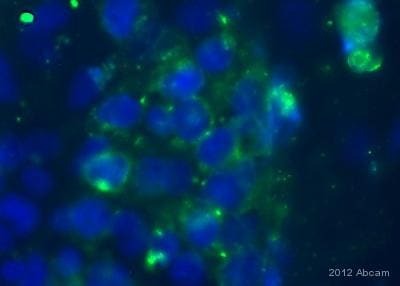 The image shows cell membrane staining of 2102Ep human embryonic carcinoma cells using SSEA3 specific antibody ab16286. Flow Cytometry - Anti-SSEA3 antibody [MC631] (ab16286)This image is from an anonymous collaborator. Anti-SSEA3 antibody, ab16286 can be used as a marker of Embryonic Carcinoma cells in Flow Cytometry/FACS. 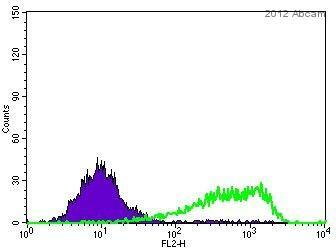 The top histogram (A) shows undifferentiated NTERA2 cells (i.e. without retinoic acid) recognised by ab16286. However, upon differentiation (by the addition of retinoic acid 10-5M for 7 days), the antibody lost the ability to recognise these cells as shown in the bottom histogram (B). Publishing research using ab16286? Please let us know so that we can cite the reference in this datasheet. Thanks for your reply. I would be happy to send a vial of ab32118. Could you just confirm your shipping address? Thank you, and I look forward to hearing from you.